Are you finding it difficult to provide your new starters with fully comprehensive MatterSphere training? New starters only understanding some areas of MatterSphere and struggling to work with the case management system? Fusion can provide standard and/or bespoke induction training in MatterSphere. We can fit around your new starter schedule in order to provide a cost effective approach to training provision. Do you have only one new starter this month? – no problem we can train one-to-one. We will provide standard core MatterSphere training over the course of 2 half days. Also available is optional refresher and extended features training. This training is not compulsory but will help to refresh understanding and provide a more in depth knowledge of MatterSphere features to enhance skills. Complete the form opposite to submit your request and preferred dates and we will respond as soon as possible. Its as easy as that. Recommended core training of MatterSphere 1 and 2. 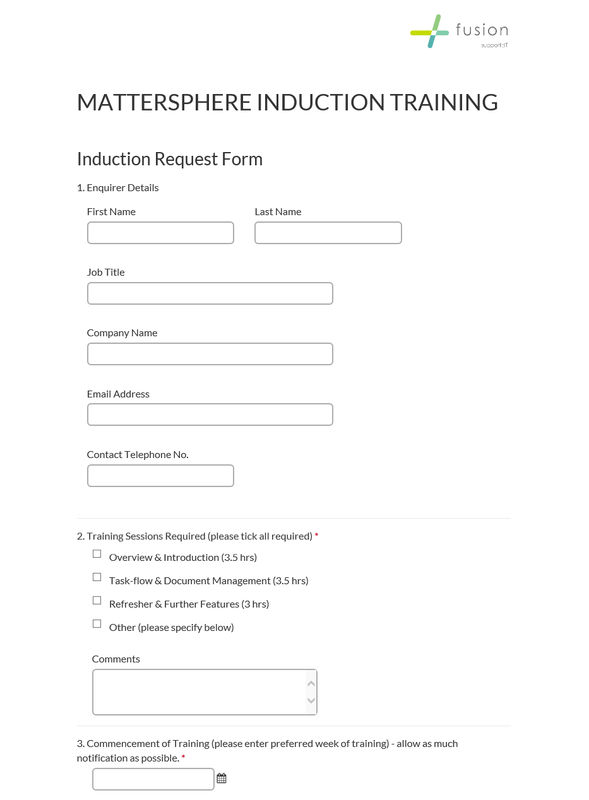 All induction training can be made bespoke to your specific firm protocols if required. E.g. Client and Matter creation process and money laundering, ID check etc can all be incorporated into any training sessions delivered. Additional training requirements such as Time Recording, Bighand/Dictation software training can be discussed and provided as necessary. Any bespoke training in addition to the standard outlines will extend the delivery time of the course and your trainer will discuss this with you.